week nine was a busy week. well, maybe not the week so much, but the weekend was. 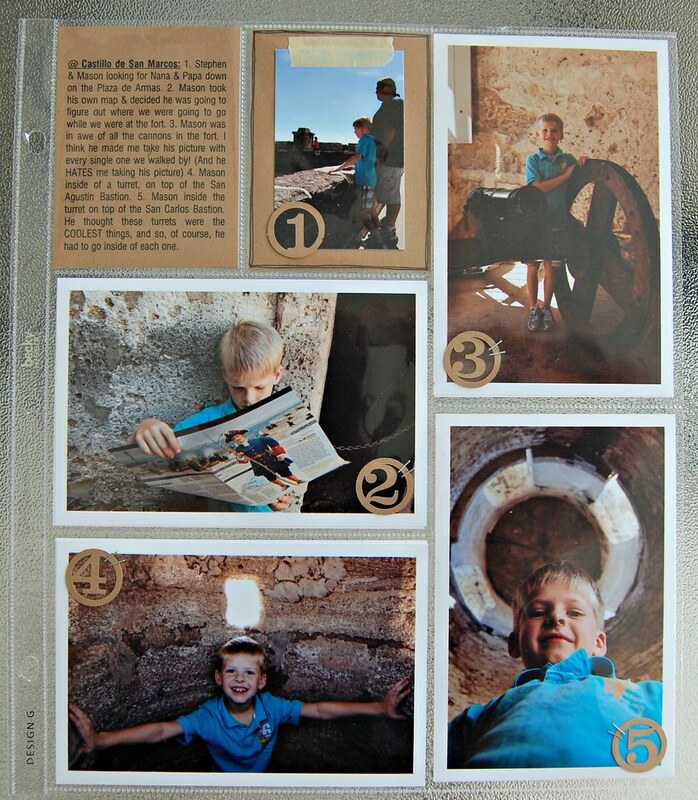 we took advantage of the locale & did some sightseeing. i ventured way from my 'two color' scheme frame of mind. there were A LOT of pictures to weed through. and A LOT that i wanted to include. i decided to stick with my 'neutrals'. two design G page protectors sandwhiched in the week. the right side is just a few pieces from mon-thursday. with a short blurb on the week in no particular detail. 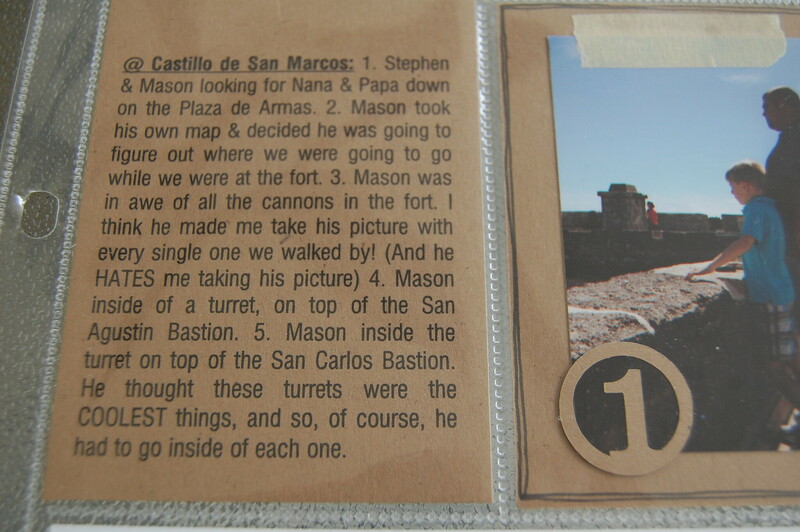 & the map from the fort cut up to fit into the two bottom 4x6 sleeves. here's the insert page by itself. i decided to take cues from my old days as a yearbook editor in highschool. each picture got a number cut out of kraft paper on my silhouette & stapled to it. 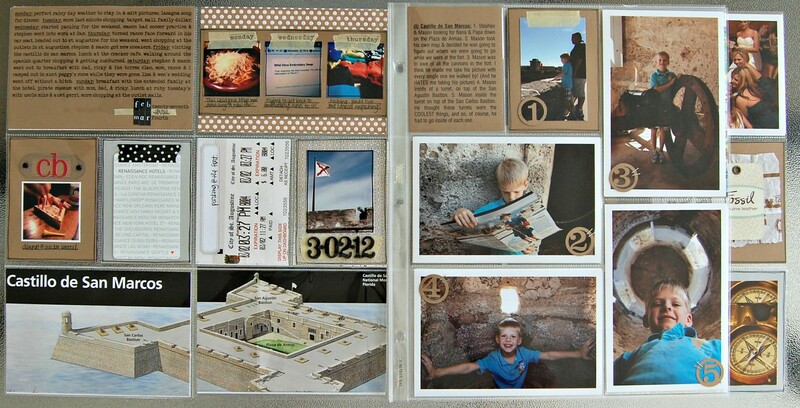 the first 3x4 slot holds journaling for the entire page, with numbers corresponding to the pictures. here's a close up of that. 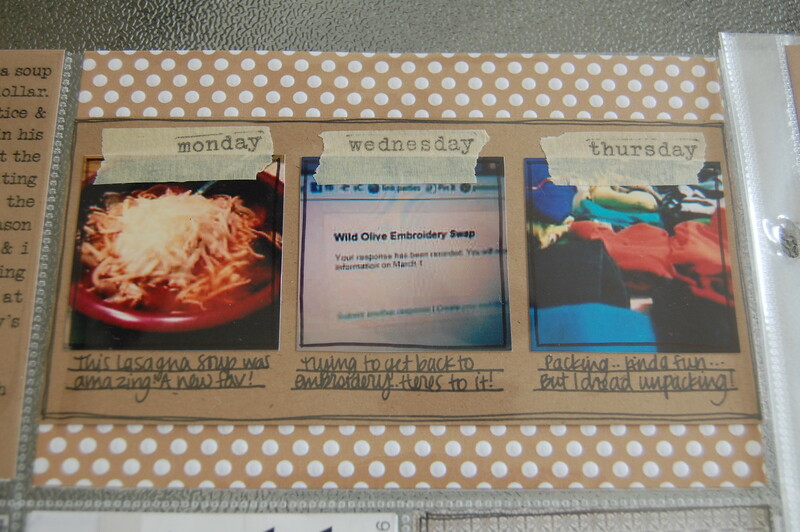 i went with minimal embellishments this week..
& put it on the memories for me. done pretty much in the same fashion as the first one. 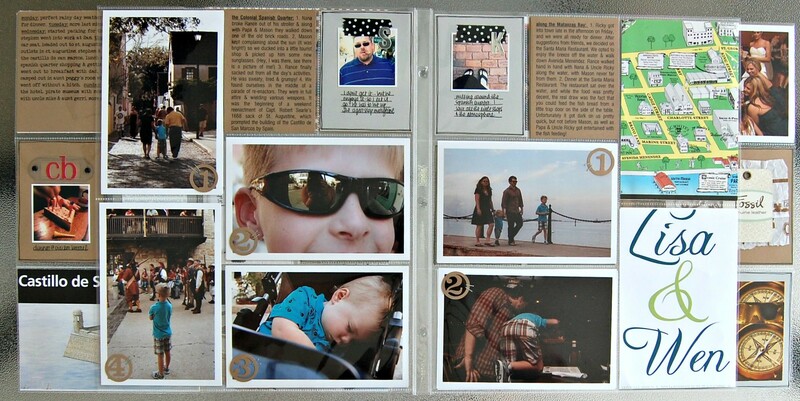 each picture numbered & journaled in the 3x4 slot. it was dark & I didn't get many good pictures inside the restuarant we ate at..
so i cut up a map in a souvenir booklet that had the place on it. by the bride & groom. the back side of design G.
pictures from the wedding which spill over onto the last page. they had a photo booth which i coaxed mason into for some pictures. 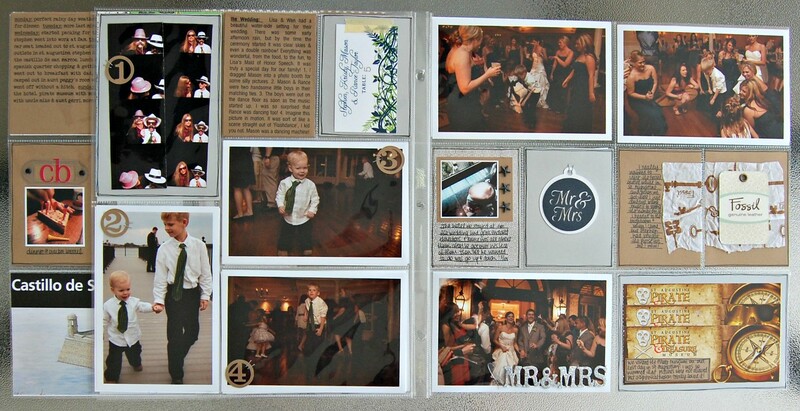 our place card & some pictures of the boys dancing. on the right more pictures of mason cutting it up. the bridesmaids were totally charmed by him. and then our tickets to the pirate museum. a close up of two of the 3x4s. 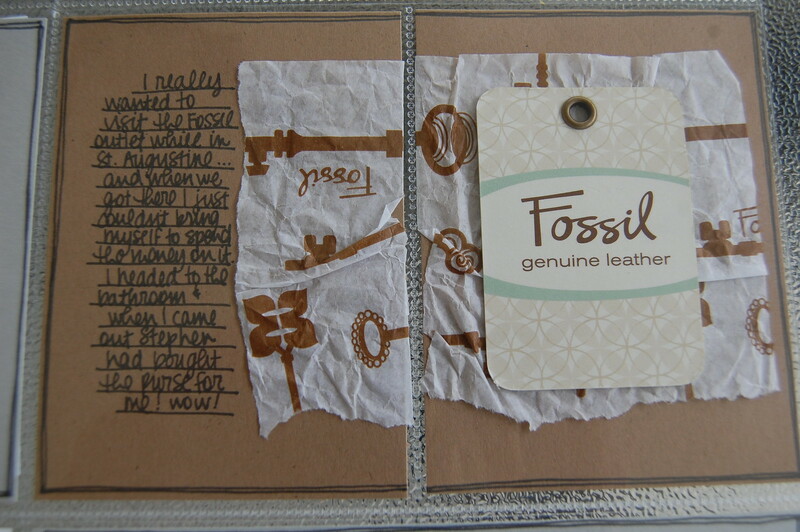 &buying a fossil purse i was oogling but wouldn't let myself get. slapped down some of the tissue from inside & the tag from the bag. this is 4x6 is from the front side design A.
i've got 10 wrapped up & plotting out 11 as we speak. questions on supplies? leave a comment. want a closer look? click on a picture.